January 2016 marks the grand opening of Sega Sammy Group‘s innovative second entertainment project with BBC Earth, Orbi Osaka, a unique facility that combines the expertise and video production force of the two companies. Orbi Osaka is located in the large EXPOCITY complex. Audio/visual integration and show control systems were developed and installed by Edwards Technologies Corporation (ETI) of El Segundo, CA, USA. ETI performed a similar service for the first Orbi location in Yokahama, which was profiled in InPark Magazine. Orbi uses the innovative technology of the Sega Sammy group that has been a cornerstone of entertainment ideas to portray the natural appearance of the mystery of life on earth over the past 50 year as documented by the high quality video of BBC Earth. 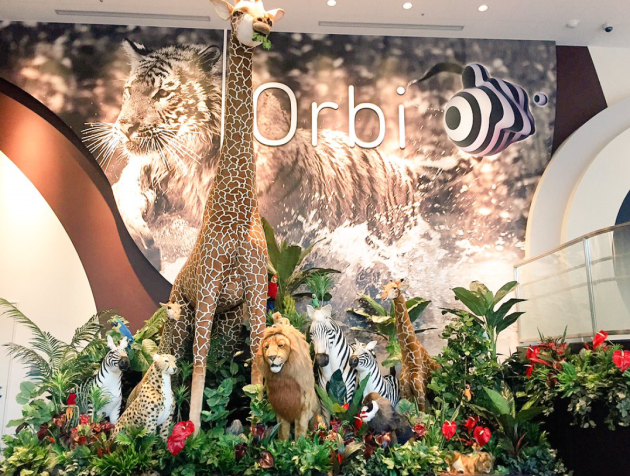 Orbi was designed as a way to explore Earth through the theme of nature, while allowing visitors to learn while playing. In Orbi, you not only to “see” and “hear” the great powerful image and sound of the natural world, you’ll also experience “smell, ” “wind, ” and “water, ” all used through innovative technology to stimulate a sense of experiencing the magnificence of nature. At Orbi, you can be part of the immersive experience. In the “Entertainment Exhibition, ” it is possible to experience in any order 10 different kinds of content that are set within various scenes on earth. You will be able to discover the mystery of rarely seen life on Earth. You can experience what it’s like as part of the herd and being in the midst of elephants and fly over the beautiful Earth with the rich Aerial video of BBC Earth. A highlight of the facility, “Theater 23.4” is a specially designed theater that reproduces the wilderness and provides an unprecedented experience. The front screen of the theater is Japan’s largest at a width of 40m and height of 8m. The theater features a completely original story from BBC Earth that was produced exclusively for Orbi. Using laser projected visual images, 3 dimensional directional sound, smells, wind, fog, and lighting effects, the Theater 23.4 production stimulates sensations within the entire body, to create an experience simulating the spectacular reality of being in the nature as only Orbi can. At Orbi, you can be transformed into various animals, have the image of a zebra appear on your face, or take a photo that makes it appear you’re in the wilderness. At Orbi’s photo spots, a lot more can be taken than just regular photos. Photos taken at Orbi are stored in the RF wristband handed out at the time of admission. In the photo terminal in the vicinity of the shop, you can look back on photos of the day. Favorite photos can be printed out on the spot and put into an original frame, or you can or make a key ring or other goods from your photos. The philosophy of BBC Earth embodies a “become more like the Earth” concept. Orbi Osaka original products are goods designed to stimulate intellectual curiosity and the official shop is well stocked with Orbi inspired items. Galileo thermometer by mysterious glass and temperature move the ball to forecast the weather, such as San catcher dye sunlight into rainbow the room instead of the rainbow colors, feel the earth, goods packed for fun and the life of the earth. It provides a space for stimulating intellectual curiosity in the selection of goods. Orbi also features the Oriental Spoon, an Italian themed restaurant designed to cater to the Japanese market. To review the original article at InPark Magazine, please click HERE.